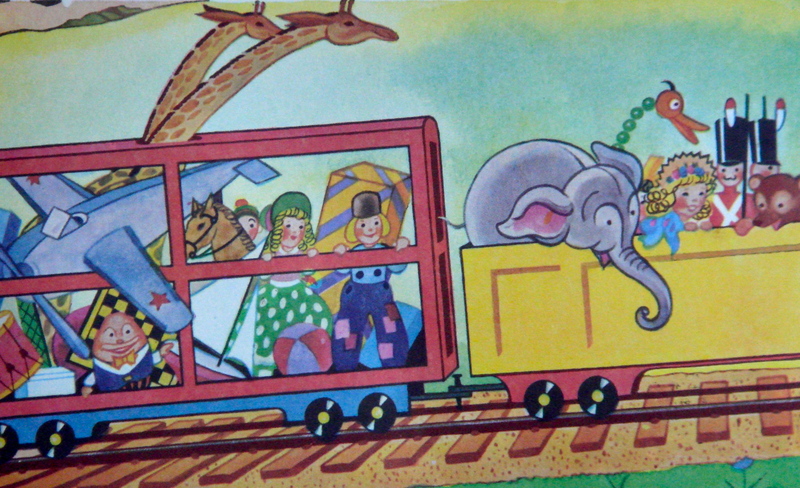 “I think I can” became such a standard in American vernacular that the phrase, along with the book title “The Little Engine That Could”, were actually trademarked by Platt and Munk. The original illustrations were by Lois Lenski, but new illustrations were commissioned from George and Doris Hauman in 1954 and these are the ones with which we are familiar. 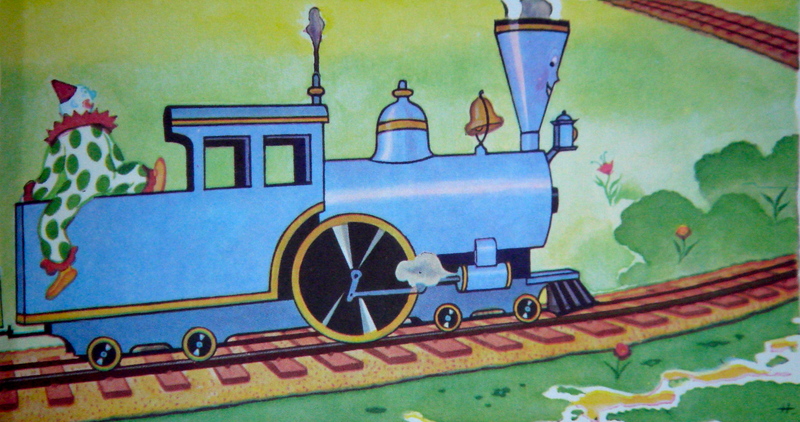 The little blue engine’s bright open face appears on her smokestack, the gold band on the top giving her something of a Nefertiti look (the engine design was also trademarked.) 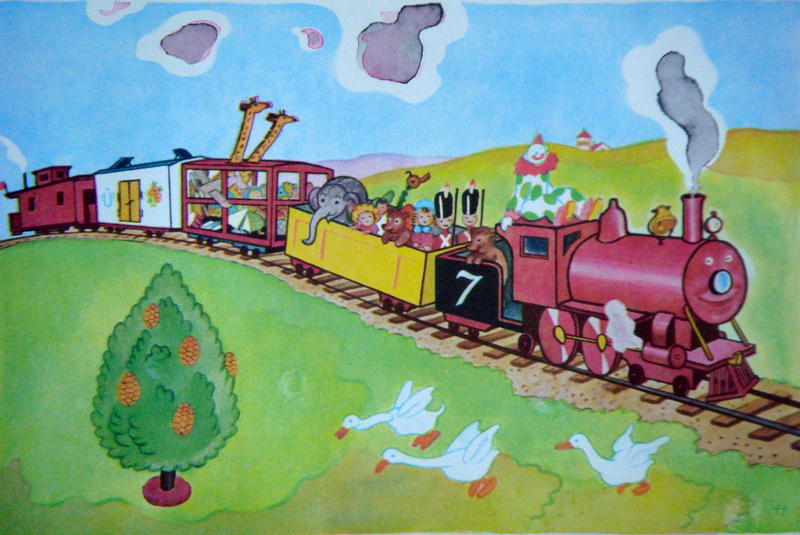 The toys from the train appear toylike and so does everything else – the trees, including one with a candy cane trunk, are set on little stands, the bottles of milk march along on elfin feet, the apples and oranges have happy faces, and there is an unlikely toylike windmill in the background. There is much to engage and delight. And what of the author? Who would have a name like Watty Piper? No one, as it turns out. 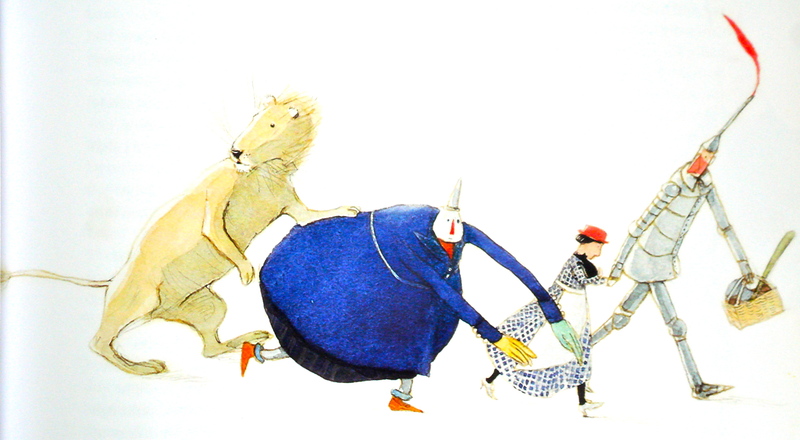 Despite putative biosketches that have appeared in some books, Watty Piper was the house pseudonym for Platt and Munk – used since the 1920’s for a series of beloved large-format anthologies with names like The Road to Storyland and Stories That Never Grow Old. When The Little Engine That Could first appeared, it acknowledged a predecessor called Pony Engine that was published in 1916. In fact, the story, complete with famous “I think I can” phrase, appeared as early as 1906 in a Sunday school tract of unattributed authorship, and there were many other versions that followed. In 1955, faced with a lawsuit, Platt and Munk offered a $1,000 reward to the person who could prove authorship and it is telling that the prize was divided between three claimants, certainly none of whom were the real McCoy. Not many stories have had as many writers claiming paternity as this one.